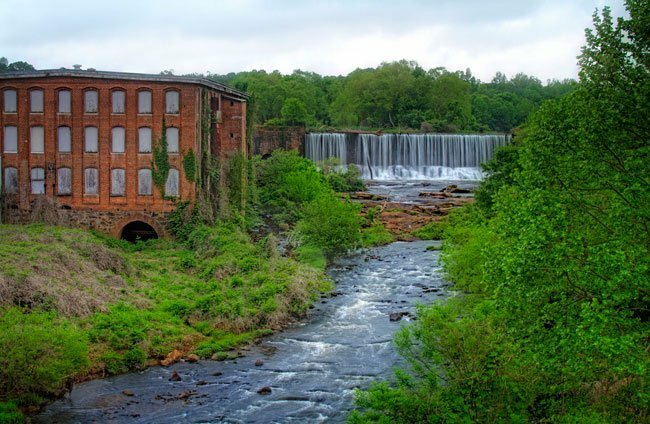 As early as the 1790s, a mill was operating in the area along the Reedy River that would be later be called Reedy River Manufacturing and finally, in 1909, Conestee Mill – the Cherokee word for “running waters.” In the 1830s Vardy McBee – known to many as the “Father Of Greenville” for developing saw and grist mills and other businesses around downtown Greenville – purchased 295 acres in the Conestee village of Greenville, located seven miles from the city. McBee’s mechanical supervisor, an engineer and millwright from Scotland named John Adams, came with McBee to Conestee in the mid 1830s and built the dam in the 1840s. An earlier, much smaller dam likely was built prior to Adams’ construction. McBee established a paper mill and textile mill here, calling it McBee Manufacturing. The village expanded, and soon McBee Methodist Chapel – also built by Adams – was added to the community in 1841. In 1862 McBee sold the mill to J.W. Grady, D.O. Hawthorn, and W. Perry. It is thought that during the Civil War, material for Confederate Army uniforms was manufactured at Conestee. The dam was rebuilt in 1892 and formed Conestee Lake, and the mill continued operations throughout the mid-twentieth century. The mill did not cease production until the early 1970s. 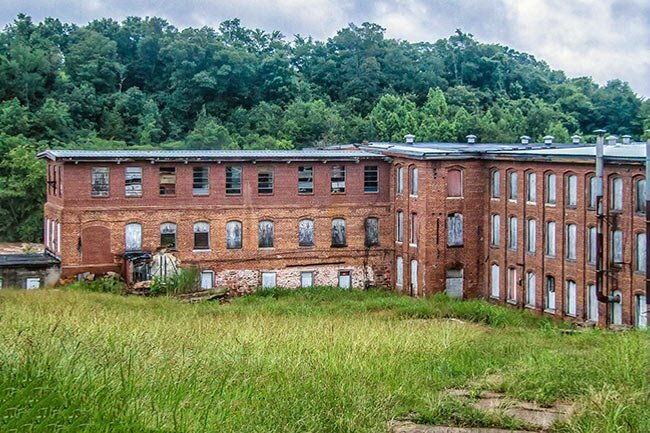 Hyman Brand purchased the former mill and its buildings shortly after the mill foreclosed in 1978. Brand is hoping to sell the buildings for redevelopment. 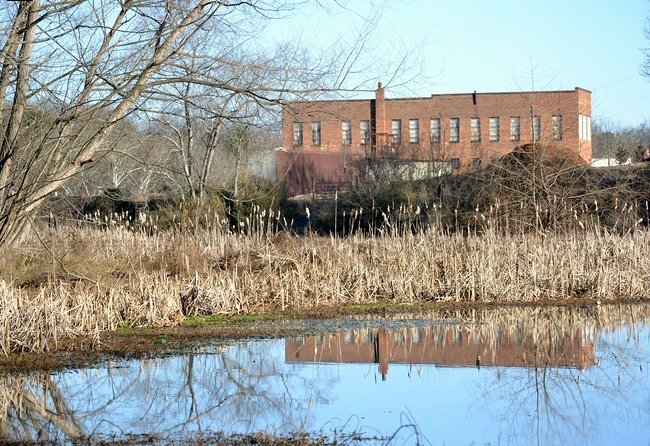 The mill was added to the National Register in 2014 as well as the dam and parts of Lake Conestee Nature Park. I lived in Conestee as a child. This was somewhere around the early 40’s. My dad and mom both worked in the mill. My two sisters and I would stand on the bridge and throw rocKs into the river. Also, when we walked by Conestee Cemetary. We would throw a rock on the graves because Indian Legend said it was good luck…bad luck if you didn’t. I remember us kids chasing a horse drawn wagon loaded down with sugar cane stalks. We would pull a piece off. Also, a friend had an old mare. There would be at least three of us kids riding at the same time. Those were the days when kids could run all over the neighborhood. Also, I remember a small store up the street from our house. The owner was called “Pinky”. He sat in a chair outside in front of the building leaning against the wall. Us kids would go buy a nickel worth of candy and he would always give us a little more than a nickle”s worth. Those were happy times! We moved to Greenville 2 years ago and live in River Mist. The closing of Ashmore Bridge and redirected us past the Connestee Mill and waterfall. I loved the Waterfall and Mill as we drive past it everyday. I was hoping that someone or some organization had plans for that complex of buildings and falls. It is gorgeous and full of history. I want to see that Falls area revitalized!! It is a shame that it is just standing there in the weeds. I have a postcard (original photo) of Odell Mill No. 4 on fire August 15 1908. Someone has written on the back ‘in Conestee, SC’. Was this mill ever in textile production? Since Conestee is the Cherokee word for running waters, was this area a large Cherokee Community? I would like to learn more. Possibly, family members with Cherokee heritage was from that area. Hope the mill will be preserved and will offer tours. I wish we could preserve this historic mill, too. Tour through a mill to become educated on the historic value of the mill. What a beautiful piece of history just sitting there. I wish that piece of history could share, talk, and demonstrate what it was like when the mill was in operation.